If you are marketing your practice in the same way you did five years ago, you are missing out. In a crowded legal market, lawyers leveraging digital marketing tactics stand out. 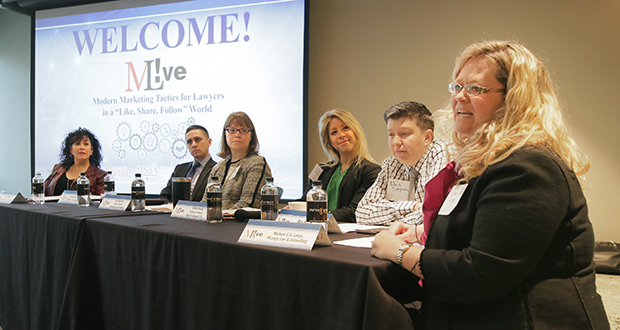 This was the focus of a panel of attorneys that convened on May 2 for a forum titled “Modern Marketing Tactics for Lawyers in a ‘Like, Share, Follow’ World.” Panelists shared insights on everything from Google search ranking and Facebook advertising to blogging, websites and social media. In addition to practical insights, the panel discussed how to navigate ethical challenges with modern marketing. The three-hour CLE, sponsored by Minnesota Lawyer and the Minnesota State Bar Association, featured speakers from small, midsize and large law firms, as well as an attorney from the Office of Lawyers Professional Responsibility. Kristin Rowell, shareholder at Anthony Ostlund Baer & Louwagie, kicked off the discussion by explaining that human attention spans have shortened in recent decades. As a result, attorneys have about nine seconds to grab the attention of a potential client, and marketing efforts need to be brief, yet impactful. In the digital age, how do lawyers make the best use of these nine seconds to propel their personal brand? Blogs, social media, articles, digital advertisements, websites and video — tools outside the comfort zone of attorneys practicing for decades, but directly in the wheelhouse of young lawyers. But just because new marketing mediums exist, tried-and-true networking principles apply. “A personal touch is still the way of attracting new clients to your firm. We just have new avenues where potential clients are gathering,” said Michael Boulette, an attorney at Barnes & Thornburg. Digital marketing efforts have to be personal and woven throughout a practice. “Clients are people too, and they want to know, and like, the lawyers they hire,” explained Davis Senseman, founder of Davis Law Office. For Senseman’s small firm, this means distinguishing her firm’s brand through a catchy website, davismeansbusiness.com, which features attorneys’ kids and pets in the law office’s video. She also chose to be edgy, using fluorescent green, orange and blue colors in her marketing efforts. “There are no gavels on my website,” declared Senseman. All of this causes potential clients to stop and take a few minutes to get to know what her firm is about. The panel encouraged audience members to find topics and avenues for marketing that they are passionate about. Whether a blog, social media post or article, marketing efforts need to be authentic. “Clients know if they are being sold to versus an attorney that is trying to broadly convey helpful information,” said Boulette, who authors family-in-law.com, a blog covering family law trends. He said that in order to attract readers, blog topics should be timely and things that clients care about. In addition, length is important. “Blogs are not law review articles. Use a conversational tone and keep them short.” Approximately 300-600 words is Boulette’s guideline. For something longer, write an article. Rowell talked about a lifestyle article written about her in Minnesota Lawyer. The article went viral, with more than 25,000 views via her social media feed, after she posted it on LinkedIn. “A couple times a year I commit to writing an article, showcasing my knowledge on a topic. Then I use these articles to gain traction on social media,” explained Rowell. In order to stay on top of a consistent digital presence and track effectiveness of their efforts, attorneys need help. Whether leveraging internal marketing professionals in the firm or hiring an outside marketing consultant, panelists emphasized the importance of someone holding you accountable. “Even though we are a small firm, we are busy. I need someone to say, ‘It’s time for another newsletter to go out’ otherwise, it just does not happen,” said Senseman. No matter the medium, in the digital age of lawyer marketing it’s about engagement, not activity. “Think about quality over quantity,” said panel moderator Terrie Wheeler, president and founder of Professional Services Marketing, an outsourced marketing and coaching firm for lawyers. Digital or not, lawyers need to heed the rules of professional responsibility when it comes to advertising, confidentiality and misleading statements. “Revealing confidential information when blogging or posting to social media, or making false or misleading statements online — these are the two areas where our office sees the most concerns with digital marketing,” said Amy Mahowald, assistant director at the Office of Lawyers Professional Responsibility. Need another piece of sage advice when tweeting, liking and posting? Make sure your clients want to be engaged with you on social media. Get their permission before you publically communicate with them on Facebook, LinkedIn or Twitter. Also, if someone comments negatively about you or your practice in an online forum, be careful how you respond. Don’t reveal any client confidences when posting a comment back. Lastly, lawyers need to stay abreast of the ethics rules against direct solicitation. The rules try to prevent attorneys placing undue influence over someone needing legal advice. Does that mean you can send Facebook ads to someone that posts he was in a car accident? Is that the equivalent of running a billboard outside an emergency room or handing out a business card in the hospital? It is these areas where the ethics rules are gray. “The rules have not caught up with the modern marketing tactics available to attorneys,” noted Mahowald. But that might change. Proposals to amend some of the model professional responsibility rules to accommodate for challenges associated with modern marketing mediums are pending with the American Bar Association. The advice from the panelists: If it feels like it might violate the rules, then don’t do it. Never name a client or share confidences online. Hold off on blogging about things that could be used against your clients. Be a thought leader, not a used car salesperson. Comment on cases and legal trends; don’t offer specific legal advice. If you do describe a case, talk about it generally, and make sure you don’t comment too soon after the case concludes. Above all, if you are questioning the appropriateness of your digital marketing tactics, call the Office of Lawyers Professional Responsibility. They offer free advisory opinions and can help you apply your situation to the rules. But call them before you take action, not after. With a myriad of new marketing channels, it is easy to get distracted and try to be everything to everyone. Panelists advised audience members to hone their tactics to the audience they wish to serve. Attorneys need to find their niche and use that as a differentiator online. “You can’t be the go-to person for everything, and you can’t say yes to everything. Spreading yourself too thin doesn’t help you gain more clients,” cautioned Boulette. And remember, there is still room for “old school” legal marketing. The panelists acknowledged that their firms still run advertisements in print to reinforce their brands. Michele C.S. Lange is a freelance writer and attorney based in Minneapolis, MN. She has more than 15 years of experience in the legal technology industry and can be reached at mcs222@yahoo.com.